Back in 2008 students of the Juilliard Dance Division participated in the Antony Tudor Centennial Celebration, the 100th birthday commemoration of the late choreographer. The purpose of the weekend celebration was to bring together generations of dancers, writers and musicians who were touched by Mr. Tudor and his work. 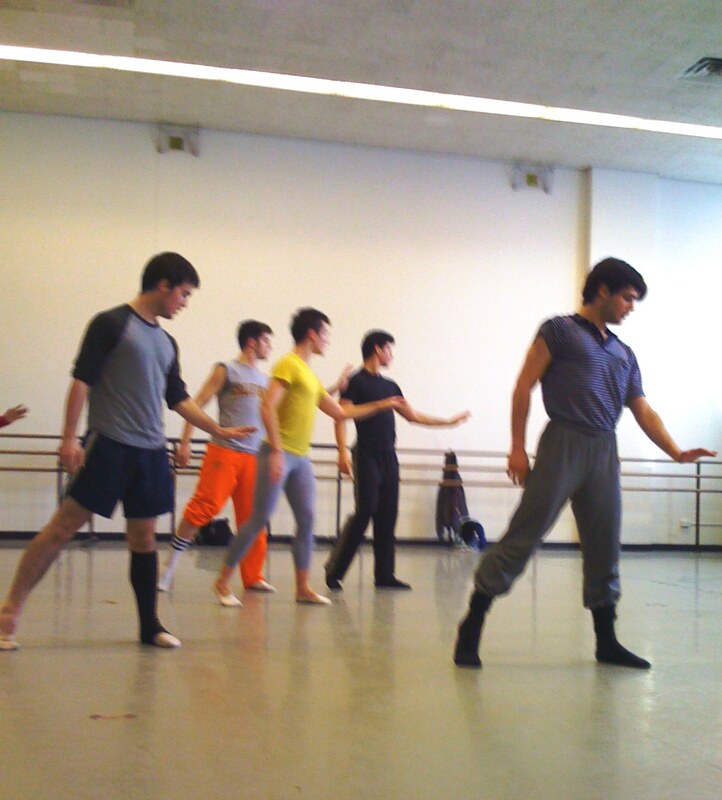 In addition to class workshops and a performance of Dark Elegies at the Juilliard Spring Concert, the weekend included informal studio performances of Tudor’s Little Improvisations, Continuo, Undertow and Judgment of Paris, performed by Juilliard students as well as dancers from the JKO School at American Ballet Theatre, ABT II and New York Theatre Ballet. And that’s where the applause comes in. As event coordinator of the Tudor Centennial weekend I was invited to observe a rehearsal, along with Sally Brayley Bliss, Trustee of the Tudor Trust, of Tudor’s Undertow by Juilliard dancers under the direction of Trust Répétiteur, Kirk Peterson. That day, just prior to the Centennial, students were rehearsing in a 3rd floor studio at The Juilliard School at Lincoln Center. Sally and I were ushered in and seated – Sally in front of the mirror on a folding chair next to Larry Rhodes, Director of the Dance Division, and I, refusing a chair, just plopped down cross legged on the floor next to them. The dancers worked with the taped music of William Schuman’s commissioned score, stopping occasionally to grasp one of Kirk’s pointed corrections, and I was excited to observe. During a short break, Kirk introduced Sally as Trustee and the person responsible for these wonderful Tudor ballets. The students were thrilled and began bowing and applauding her, as proprietor of these important works. Then, to my surprise, I was also introduced – as Event Coordinator of The Tudor Centennial. And again, all of the dancers began bowing and applauding, but this time, to me! Me? They bowed and applauded me?? What a reversal of fortune – dancers applauding me, instead of the other way around. Will wonders never cease? I was sitting at a long outdoor table at Café Fiorello at the end of a crisp October day in 2007, overlooking the spraying fountain on Lincoln Center’s plaza. Among those at the table were Sally Brayley Bliss, Trustee of the Antony Tudor Ballet Trust, and Tudor Centennial committee members Ernesta Corvino, Lance Westergard and Donald Mahler. We had just left a long first meeting of the Antony Tudor Centennial Celebration, being planned for March, 2008. The meeting, which took place across the street in a Juilliard conference room, also included the wonderful Elizabeth Sawyer, Antony Tudor’s pianist for 17 years, Amanda McKerrow, the amazing prima ballerina and former star of American Ballet Theatre, Diana Byer, Artistic Director of New York Theatre Ballet and Yasuko Tokunaga, director of Dance at The Boston Conservatory. The committee included over 33 American Ballet Theatre alumni, Juilliard alums and assorted ballet luminaries. The Centennial Celebration, for which I was hired as event coordinator, was to be held at The Juilliard School, March 29 & 30, 2008. The weekend was designed to bring together generations of dancers, writers and others who were touched by the life of Tudor, and would include teaching workshops reconstructing his class combinations and choreography. They were also going to feature panel discussions with dancers, writers and musicians. (Ultimately, the event was attended by over 250 guests and participants). So what brought me to the Tudor Trust? A year or so before, with a bit of luck and some really great contacts, I had the opportunity to meet with Rachel Moore, Executive Director of American Ballet Theatre. 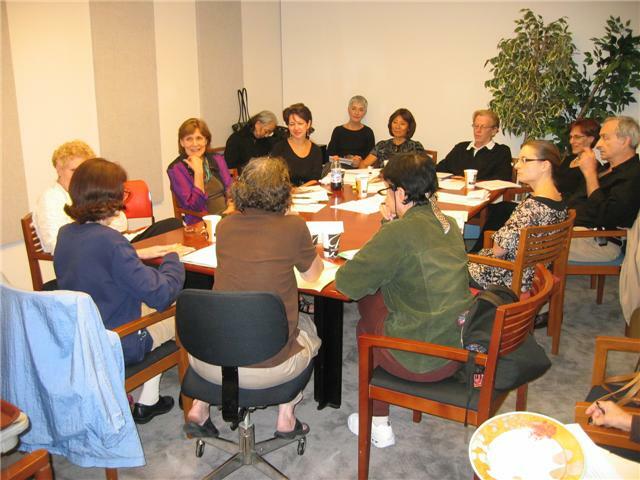 I was soon given what for me was the ultimate gig – planning and executing the American Ballet Theatre Dancer Reunion which took place on Memorial Day, 2007. Working in the Ballet Theatre offices for close to a year’s event planning is a story in itself (more later) but after that wonderful event for 600+ dancers (including a cocktail reception, “JKO” school demo, performance, on-stage post performance bow and party), my credentials were sealed. I was taken on by the Tudor Trust for the Centennial event at Juilliard. Now here I was having my drink, watching the sun set over Lincoln Center plaza while listening to the laughter, lively conversation, and most importantly, the wonderful stories of the Met and Tudor. Past and present had combined in the most wonderful way. I felt I had returned to my childhood roots, working with people who loved the ballet, who understood the importance of the arts, who shared my passion. I had come full circle, sitting at that table with these incredible artists, staring at that magnificent fountain-sprayed facade so many years later. I had come home. THE “NEW” MET! WHAT A DIFFERENCE! 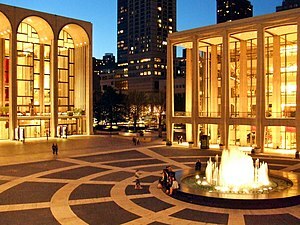 In September, 1966, the new Metropolitan Opera house opened its doors at Lincoln Center in New York City’s Upper West Side. 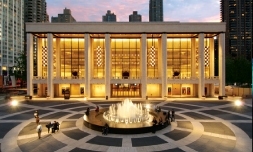 The Center spanned 16 acres and eventually had 12 resident organizations, including The Met, New York City Ballet, The New York Philharmonic and The Juilliard School. 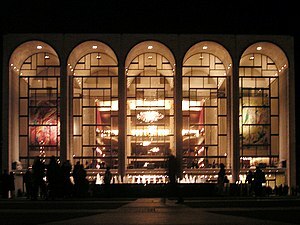 The Metropolitan Opera House was, and still is, located at the center of the Lincoln Center Plaza, on Columbus Avenue between 62nd and 65th Streets. The outside walls were made of travertine marble; a giant circular fountain stood in front of the building, and hung from the entrance foyer were the wonderful murals by Marc Chagall, specifically created for the space. And what about the beautiful red carpeted lobby, and those gorgeous starburst chandeliers that rose to the ceiling before a performance? 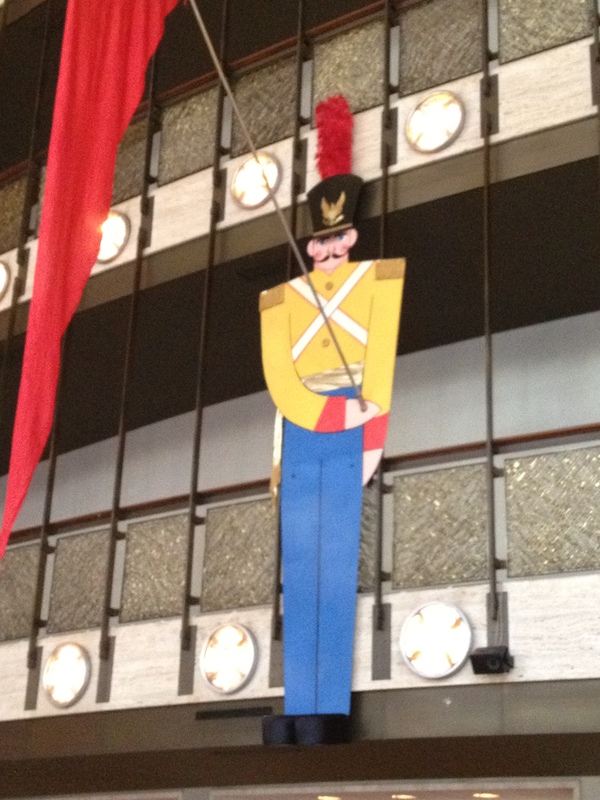 A shocking change, this theater, from the old Met Opera House on 39th street. Clearly, we had to move – the old Met didn’t have adequate space, and the new one had all of the needed technical facilities, but the old Met, in my heart, was still a gem. I remember Jackie Kennedy tried to “save it” – make it a historical site, preserve it, but in the end she failed and it was raised to become nothing but a nondescript office building. But here we were at the new Met, and like wow! REAL dressing rooms, with rows of mirrors and lights and lockers and showers! There was an intercom system where you could hear an announcement when you were supposed to come up to the stage. There were wardrobe rooms, and makeup rooms, and fitting rooms, and makeup ladies that came to your dressing room to apply their craft. We would rehearse on stage and there would be a group of gray uniformed ladies in the orchestra, wiping and polishing the chandeliers that were lowered to seat level for cleaning. How they made them shine! There was a revolving stage, with sets that could appear and disappear – no more dragging sets into the street in all kinds of weather. The curtain went up at the push of a button. No one had to pull the cord! The difference between the two theaters was staggering. 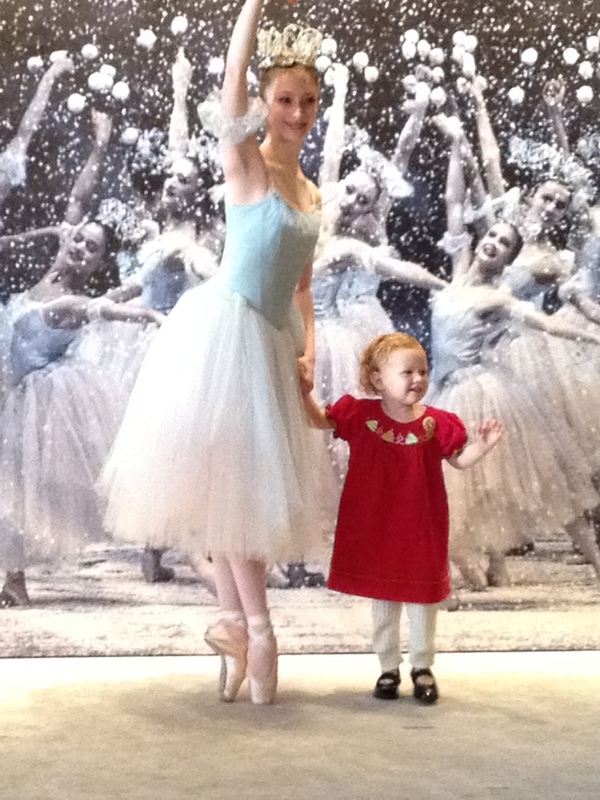 In the new Met, ballet classes and rehearsal halls were downstairs. In those days no one was allowed to bring water into the studio – and, of course, there was no such thing as “bottled water” – after class you could go to a water fountain to take a sip. There were “no-smoking” signs in all of the studios, but tons of cigarette butts were left on the floor beneath them. The floors in the studios were perfect, the walls gleaming. I had a locker. It was exciting.